DAVE Hill’s letter (13 February) cannot go unchallenged. 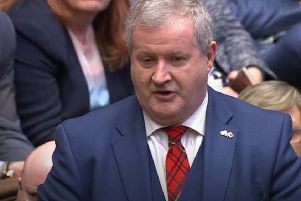 His comments regarding the £1.4 trillion UK debt and his claim that Scotland only got “a wee bit back” of the oil revenues over 40 years are evidence of his failure to put his figures into context. For example, if he looked further at the debt figures he would have understood they represent around 82 per cent of the UK’s GDP which is similar to Germany, France and the US. Although challenging, it is a manageable figure due to ease of UK borrowing and very low interest charges for sterling. The reason the debt has increased during the Great Recession is that the UK, like the US, introduced quantitative easing in order to reduce the impact on public spending cuts and to prime the economy. However this has not been the case in Europe, as they have followed a doctrine of a tight money supply which has led to massive unemployment, draconian cuts in public spending and severe cuts in wages and pensions for many. In contrast, the UK economy is 2.5 per cent higher than before the financial crisis, unemployment is half of Europe’s and the forward growth rate of 2.9 per cent is only equalled by the US.